Was super suprised this morning to wake up to winning Honorable Mention in Fashion | An Elegant Story at the 5th Annual Masters Cup Competition! I actually forgot about it, blonde moment so it was truly a big surprise! See below excerpts from the Official Website and have a look at the amazing work. A big congrats to all the winners, there are such beautiful work out there and I feel truly blessed to be mentioned in this distinguished group of professional creatives! Also thanks to the wonderful Jessie Talba, Mo Al Falasi, the wonderful Ezra for his beautiful gown and my dear friend, the gorgeous Stefanie Ost for their wonderful contribution to this great award! Super News! 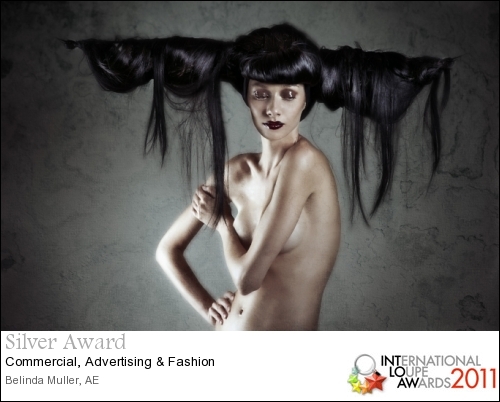 I have once again been honoured at the WPPI 2010 8×10 Print competition held in the United States and this time I received 6 Accolades of Excellence awards and a first place in the Advertising/ Fashion category! Needless to say I am elated and humbled by these honours! I feel blessed by this recognition to the love, work and energy I put into my work. I really feel the best way to get your work measured, to have them exposed to an international market where you get an honest and balanced view of your work! I also wish to thank all those wonderful and dedicated creatives who have been with me on my journey so in making these wonderful images and awards possible! Last but not least to my hubbie, Werner for always believing in me!